Is GameStop Stock a Buy? Do a low earnings multiple and high dividend yield mean that investors should jump on GameStop stock? GameStop (NYSE:GME) stock has taken a beating as the prospects for its business model have dimmed, declining roughly 37% over the past three years in conjunction with falling sales and a challenging competitive outlook. Shares fell 8% in the day after the company announced that same-store sales in the important holiday stretch declined 18.7% compared with the prior year. Large valuation declines have pushed the stock's forward price-to-earnings ratio to roughly 6 and its dividend yield to 6.5% -- qualities that could make the stock enticing for value and income-focused investors. Is GameStop stock worthy of a buy as the company attempts to restructure its business to keep pace with the changing retail environment or a sinking ship that should be avoided? At the root of GameStop's troubles is the video game industry's transition to digitally distributed content. The retailer's lifeblood comes from the sale of physical software at its brick-and-mortar locations, but software publishers including Activision Blizzard (NASDAQ:ATVI), Electronic Arts, and Take-Two Interactive derive substantially better margins from digital sales, and console platform holders Sony (NYSE:SNE) and Microsoft (NASDAQ:MSFT) are increasingly well equipped to allow users to skip using physical media. The digital content transition hurts GameStop at multiple levels. With fewer users purchasing physical copies of new games, there are also fewer games traded in at GameStop -- a trend that threatens to put a huge squeeze on the company's revenue and profitability. In the company's most recently reported quarter, new software sales made up 31.5% of revenue and 21.2% of gross profit, while used software accounted for 24.3% of revenue and 30.8% of profit. In short, the leading video game retailer is staring down a dynamic that's similar to the ones that ultimately shuttered chains such as Blockbuster and FYE. The current technological trajectory suggests that it's only a matter of time before the video games software industry goes entirely digital. How is GameStop responding to the shifting market? The company's most recent quarter saw roughly 50% of earnings come from categories outside of physical game sales, but this was during a stretch when hardware sales declined 20.6% and software dipped 8.6%. GameStop has been investing in new business avenues to diversify and protect against a future in which fewer consumers get their games through its retail channels, but thus far, there's not much evidence that these ventures are a fix for its shaky fundamentals. At the moment, the company seems most keen on touting its growth in collectibles, and it plans on opening new locations for its toy-focused ThinkGeek stores. "As we talk with our video game partners, I think what they see in this is, there is a category that is almost as big as physical video gaming. And the perspective for our business to grow with them on the collectibles side, close to what it is on the video game side, is a big opportunity." The company anticipates that customer data gathered through its PowerUp Rewards membership program will allow it to deliver targeted collectibles promotions that give it a sustained and decisive advantage in the space, but the outlook on games-related merchandise seems overly optimistic. While GameStop's membership data surely produces valuable insights, Amazon has a much greater array of information to work with and will have little trouble matching the games retailer when it comes to ad targeting or product bundles. The company Is also pushing the growth of its technology brands, which includes mobile phones and PC products, but there's not much to distinguish the retailer from its competitors in the space, and it doesn't look like a solution to the problems facing the company's core business. The move into software development looks like a more promising long-term solution, but it will require continued success in a highly competitive space, and GameStop faces a long road ahead if it's to build an established position in content. Its digital segment accounted for just 2.3% of sales and 5% of profit last quarter. 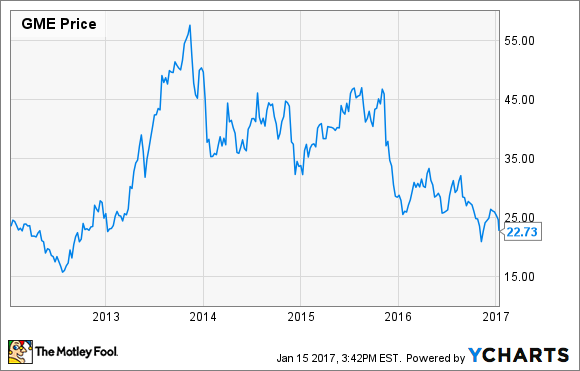 But do the valuation and dividend make GameStop worth it? With its recent announcement of disappointing sales over the holiday stretch, the company is now guiding for between 10% and 12% sales decline on the year. The launch of new consoles from Nintendo and Microsoft this year, as well as the likelihood that Activision Blizzard's next Call of Duty will perform better than the series' 2016 installment could boost sales and profitability in 2017 and prompt the retailer's share price to rebound, but the long-term outlook appears bleak. The biggest momentum driver for GameStop stock in the past five years came in the lead-up to Sony's and Microsoft's new mainline console debuts in late 2013, but the next mainline evolutions of the respective platforms will likely be even more geared toward digital distribution, and banking on Nintendo's more retail-friendly Switch console looks like a risky move. With pressures on new and used software sales, and GameStop's other segments showing limited signs of promise, closing stores and buying back shares look to be some of the company's best drivers for earnings growth. So while a low P/E and a chunky dividend might be tempting, it's probably best for long-term investors to hold off on GameStop.